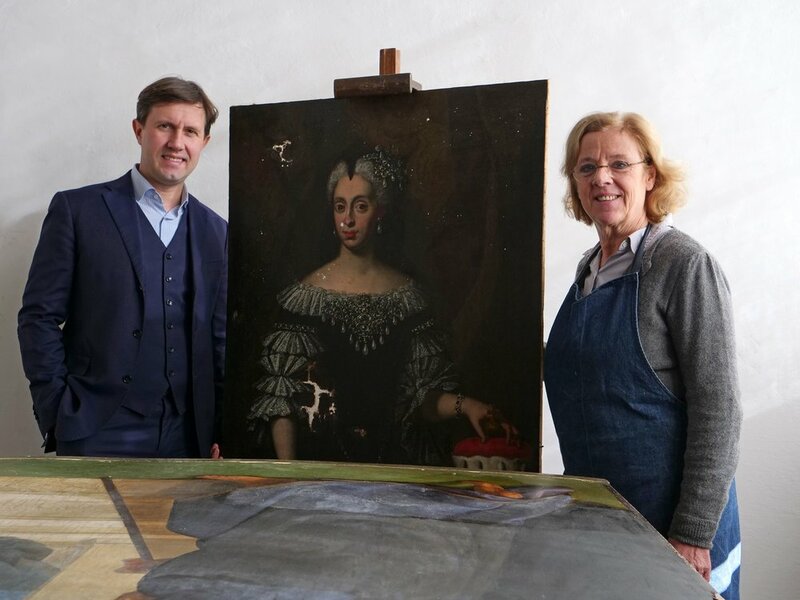 AWA's portrait of Anna Maria Luisa de' Medici meets Florence Mayor in restoration studio. She was singlehandedly responsible for safeguarding Florence treasures for posterity. We describe Anna Maria Luisa in that way, so it's AWA's honor to have her portrait among our restored paintings. This quote by Jane Fortune sums up our founder's decision to personally sponsor the restoration of this portrait although its authorship is unknown: "Because of my work with Advancing Women Artists, I was approached by Palazzo Vecchio's curator who wondered if I'd like to personally sponsor a project that would restore the painting to its original dignity for Palazzo Vecchio's Reception Room, where the Mayor welcomes diplomats from all over the world. Anna Maria Luisa de' Medici is the patroness par excellence and it has been my honor!"